Anyone with a ticking heart and an Instagram account takes too many pictures of their newborn. It's okay to be proud! It's okay to coo and adore and love and snap photos of your baby! But at a certain point, probably past the 700 mark, those pictures become variations of the same damn thing. Helpless baby lying on bed. Helpless baby lying on bed with mouth open. With arms raised. Crying. You get the point. But it doesn't have to be like that! 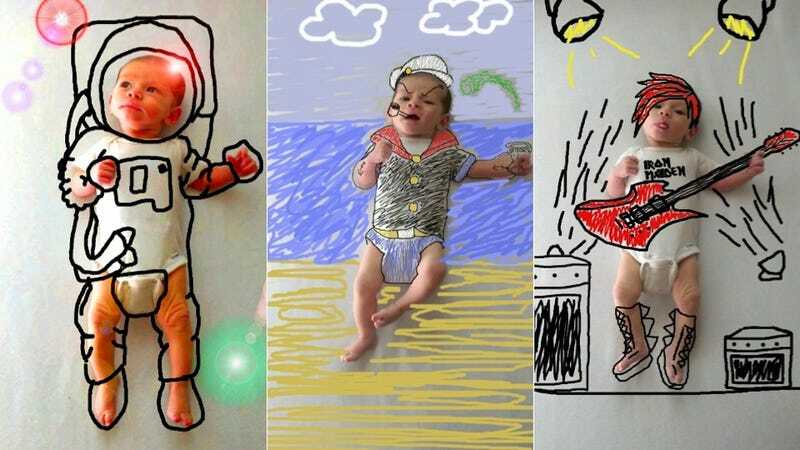 New mom and fantastic person Amber Wheeler did something different with her pictures of her newborn son: she tapped into her childhood imagination and used basic computer illustrating skills to cook up adorable situations for her son to be in. Depending on the pose, he could be an astronaut, a rock star or a superhero. Sometimes he could be dancing, sometimes he could be scuba diving. Every time it's just so freaking awesome.